If you are looking for a leisurely, Cornish coastal break, then the Rosevine with its stunning setting on the Roseland Peninsula would be an excellent choice. It is delightful, exceedingly comfortable and you will be well looked after by a wonderful and friendly team. 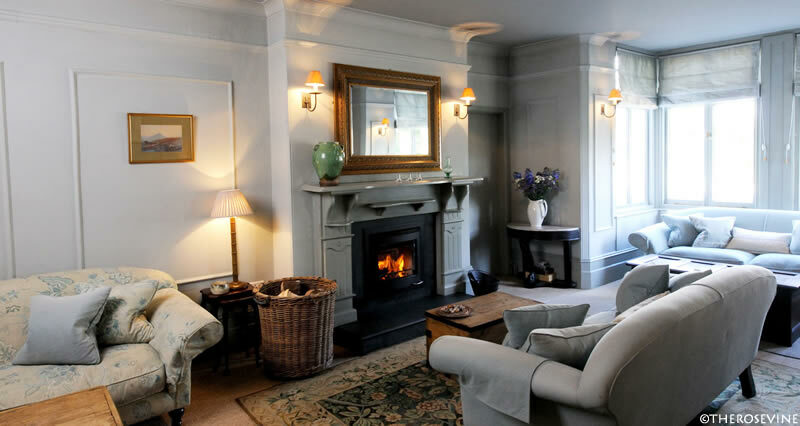 Just a stone’s throw away from a beautiful sandy beach and the South West Coast Path, the Rosevine is a boutique apart-hotel with 15 apartments, a 4 bedroom self-catering house, a Michelin Guide restaurant, cosy lounges as well as an indoor heated swimming pool. When we drove down to Portscatho from Salcombe, our first impressions were good. We had been out exploring the coast the whole afternoon and wanted to relax. The beautiful Georgian manor house bathed in golden sunshine looked inviting. And then a friendly welcome and a very efficient check-in put us in totally the right mood. At the Rosevine the accommodation choices are varied. You can choose between a studio, family apartments (sea facing & non-sea facing), family suite or a self-catering, independent holiday cottage called 'The Lookout'. We stayed in one of the Rosevine's sea-facing family apartments which had a large living area with a vintage style bed which was the focal point of the room. There was a separate second bedroom (ideal for children). Amenities included a flat screen TV, table & chairs and a kitchenette with combi-microwave oven, toaster, kettle, Espresso machine, and fridge. The staff had left a welcome letter and a jar of brownies for us. Lovely! The bathroom was compact and had a bath with shower. Bathrobes and complimentary toiletries (from The White Company) were provided. Overall, the apartment was spacious, clean and finished to a high standard. We had a very comfortable stay. It was perfect. The best part was the balcony which offered fantastic sea views! As mentioned earlier, the Rosevine has a Michelin Guide restaurant headed by chef Tim Pile. With its credentials, the restaurant promised much and we were looking forward to the dinner. And it didn’t disappoint. We had informed the hotel of our dietary preferences and Chef Tim and his team created an exciting fare of dishes suited to our taste. A big thank you to them for the vegetarian menu. With views over Gerrans Bay as a stunning backdrop, we enjoyed our delicious dinner in a relaxed atmosphere. All the dishes were perfectly flavoured and beautifully presented but the highlight was the goat's cheese starter. Great contrast of textures, lovely taste - it was absolutely gorgeous. A close second was the chickpea curry which was fantastic. Breakfast, the next morning, was served in the same restaurant. You can enjoy it al fresco in warm weather. Breakfast was a simple and non-fussy affair with a small selection of cold buffet and hot food made to order. The service was good both the times. The hotel grounds are lovely - beautiful gardens with subtropical plants and lots of seating arrangements. A few minutes walk from the hotel takes you to the beautiful and isolated sandy beach of Porthcurnick. It is a lovely beach where dogs are allowed. You can spend all your holiday relaxing at the hotel and exploring the local beach and coastline if you are that way inclined. If not, under an hour's drive and you will reach the Eden Project, Lost Gardens of Heligan, Truro Cathedral or the National Maritime Museum in Falmouth. 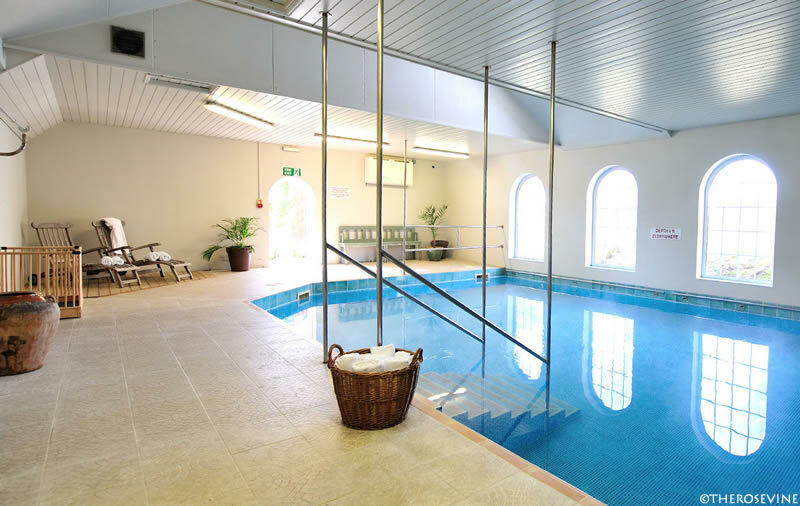 The hotel is conveniently situated for exploring the spectacular coast and beaches of Cornwall. As soon as we checked-in at the Rosevine, we knew we would have a good time. A warm & cosy atmosphere, fabulous service from all the staff members, delicious food, and an excellent location meant that we indeed had a relaxing and pleasant stay. I am sure we will return sometime in the future. If you like the comforts of a luxury hotel but with the freedom of an apartment or a self-catering space, then you will love the Rosevine. It is a family-friendly and dog-friendly hotel with a nice selection of rooms and good facilities. A peaceful and lovely place to unwind and relax! The hotel has been affectionately named 'The Big House by the Sea' and it is quite apt as it does feel like a home away from home. Prices range from £173/night for the Slate Studio (B&B, 2 guests) to £379/night for a Family Suite (B&B, 5 guests). The self-catering holiday cottage, ‘The Lookout’, is priced at £800/night (8 guests). Check availability and special offers on the Rosevine's website. *Our stay was arranged by The Rosevine for the purposes of this review. All opinions, as always, remain solely our own. Wow, What a great spot to relax for a while! The views are to die for and that food made my mouth water just reading about and looking at it! The comfort of a luxury hotel but with the freedom of an apartment seems to sum it up perfectly! The food was fabulous, Patrick. And yes, the hotel is an excellent location for a relaxing break. Wow, the Rosevine really seems to have it all! I've never eaten at a Michelin Guide restaurant so I'd be particularly keen on trying that. The food looks amazing! Also fabulous that it's walking distance from the beach! I'll have to add this to my "someday list"